UK House prices increased by 2.4% in May according to The Rightmove House Price Index, reducing the year on year price decline to 6.2%. At first glance the 2.4% growth is reminiscent of a boom market and is the largest monthly increase recorded by Rightmove since 2003. The increase could be a reaction to tighter lending controls with sellers fearing that their equity will be eroded to danger levels where they can’t find an affordable mortgage deal. However the report goes on to say that there is a disturbing reduction in the number of new properties coming on to the market. In May there were only 61,000 new real estate listings compared to the 135,000 new property listings that came to the market in May 2008. Equity Releasers: The group of borrowers who took advantage of cheap credit and rising property values to re-mortgage their property and release equity. Recent buyers: With no or low equity, this group came to the market when prices were high and now struggle to raise sufficient deposit to trade up. Equity Losers: Still with sufficient equity for a 25% deposit, some of this group are on the borderline. Sums that stacked up two years ago no longer stack up when the costs of buying and selling are accounted for. « Are the best Spanish property deals repossessions? Yes – you are right Matthew. I think the point is that vendors are unable to drop asking prices while lenders are offering naff deals, unless the borrower has a 25% deposit. Why can’t vendors drop their price? After all they’ve chosen to sell in a falling market. Houses I have seen in my area have been on for months with no drop in price, why should the onus always be on the buyer to come up with ridiculous amounts for deposits, over stretch themselves with mortgage repayments to buy something which is depreciating in value everyday. Even with a 25% deposit the banks are offering rates of between 5% and 6%, for FTB, that’s when the base rate is at a historical, artificial, low of 0.5%. What will the rates be when the base rate rises and homebuyers’ deals run out and need a new deal..probably double what it is now….but will the vendor move on THEIR price…you must be joking…I believe prices have further to fall, with unemployment rising, more people defaulting or falling behind on their mortgage repayments, unrealistic prices from vendors and Estate agents, we’re only at the early stages of the recession and talk of the market bottoming out is premature at best..in my opinion.. Ultimately it will depend on how desperate the seller is. If sellers can hold their position until the market starts to pickup, then that’s clearly the right thing to do. Alternatively – lenders could loosen the noose and offer more attractive deals. The recession won’t last forever – so I would advise sellers to hold firm and weather the storm. The longer the seller ‘holds on’ the more the property prices decrease, lenders don’t want to lend more than 3x joint income which would also clearly be the right thing to do. 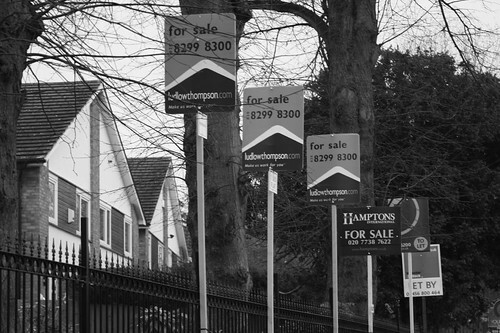 If a seller doesn’t need to sell why put your house up for sale during a recession? It seems to me that sellers want everything, they want the price for their house at 2007 levels, the height of the market, yet they come to buy again you’re telling me they will be paying asking prices???? I think the point is that people still want to sell, but are seriously constrained by current lending rules. Prices clearly aren’t decreasing because sellers aren’t reducing asking prices, infact the report shows that so far this year – prices have increased. This is clearly making it difficult for first time buyers. My advice to buyers in this market would be to look at new build properties, as now is the time to pickup a belting deal. Here we go again “The Experts” talking the market up. Asking price does not mean much, it is sale price that counts. Make no mistake for this country to turn itself round prices have to fall by at least 30%. Those who bought at the top of the boom are in trouble so if you dont have to sell DONT!. This year will see the impact of no interest on savings accounts coming to maturity so the spending power of the public reduces again which will in turn contribute to lower prices. Remember it is only worth what someone will pay not some high figure plucked out of the air by the local agent or vendor. Because sellers are receiving such low offers that’s why the asking prices are rising so there is room for the low offer. I can’t believe anyone is falling for this sort of hype. People can’t even get mortgages, first time buyers can only get 3.5 salary and must have approx £30K upfront and this country believes property prices will rise again. I think everybody has to be realistic and face the fact that property prices still have a long way to go and therefore prices will continue to drop. Sad fact of the economy I’m afraid. The Rightmove house price index report shows that prices (asking prices) have gone up – not down. It also indicates that properties are not selling. So the market is stagnant. The report suggests the reason for the stagnation is ‘equity immobility’ i.e. sellers and buyers are stuck. There’s a deadly embrace going on. Sellers want to sell and buyers want to buy but they can’t because neither party has the scope to move on their position. I would imagine that the majority of sellers are also would be buyers who need a mortgage on their prospective purchase. And there we have it…a deadly embrace because most people need a mortgage. It’s doesn’t matter if we talk the market up or down, because it’s stuck. For those who have to sell because they can’t meet the mortgage payments, then repossession is a real danger. If you want a mind blowing deal – chase that ambulance. I don’t share your negative – we’re all going to die philosophy. I think the market will turn around and that property is a good long term investment. It’s great to chat Matthew – Top man! I don’t think I’m being negative, just realistic at the moment. Property is a long term investment as long as you buy for a fair, reasonable and realistic price. What I’m pointing out though is that sellers will not budge on their valuations of their house in a falling market. That isn’t being realistic, that’s being greedy. If you want to sell your house, price it realistically, you might be surprised. If a seller takes a drop in what they want they should expect to pay less for their next property and so on…you can’t have everything, for the last 10, 11 years that has been the case but not now.